of And Thou Shalt Read, pointed these out to me. 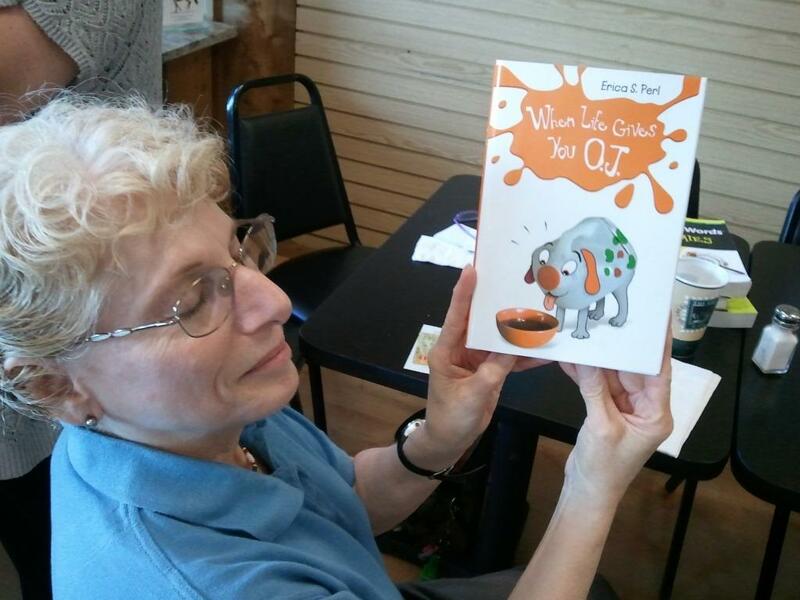 A book that teaches responsibility for a pet is When Life Gives You O.J. by Erica S. Perl. This is the story of an 10 year old girl who wants a dog more than anything. Her grandfather suggests she can show her parents she will be responsible by caring for a practice dog that is an orange juice container on a leash. 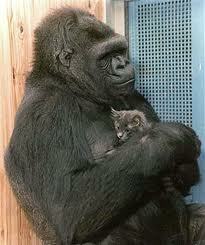 Another book that teaches lessons on responsibility is Koko’s Kitten, by Francine Patterson, the true story of a Gorilla that takes care of a kitten like it is her own. Do you have a favorite kid’s book about pets? Let us know. June is National Home Safety month, and as you take steps to make your house safer, it’s important to include your pets in your plan as well. 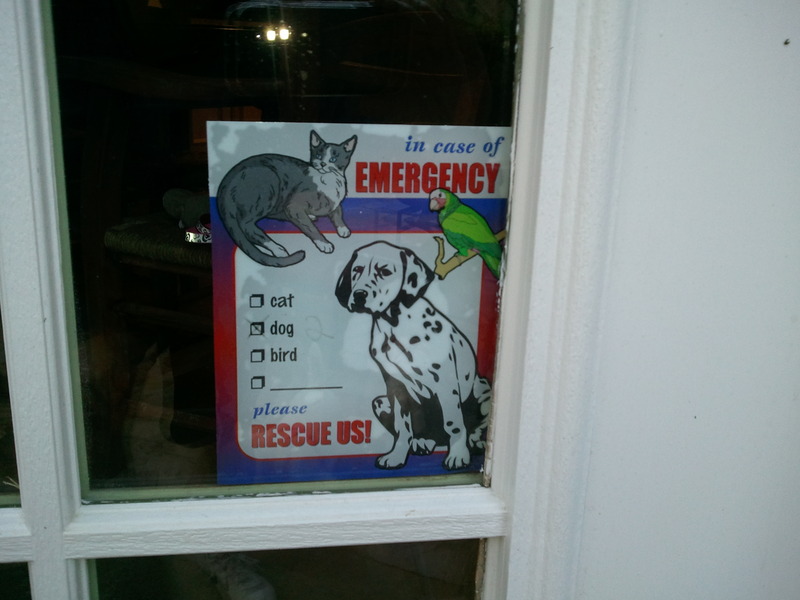 The first and most basic thing is a window sticker to let firefighters know how many pets are in the house. Several of my clients have these posted. They should be on every possible entry to the house. Another thing to do is to find where your pet’s safe haven is. You may already know it, but if you are not sure, set off your smoke detectors. Watch to see which room they run to. If it’s a closet or if there is a bed or something they hide under. This could be written on the sticker or it’s just important for you to know if you are home when disaster strikes and you don’t want to waste time getting out of the house looking for your pets. It’s understandable you want to save your pets, but you could be endangering your life or others in your family by staying in a house during a dangerous situation. Hopefully you also have a severe weather plan for your family and your pets. You can go here to find the things you need to do when your area is under a tornado warning. To keep your pets safe, you need to have their crates handy and put them in the crates during the warning period. This way the crate will protect them if there is damage to your house, they can’t run away if there is damage in your house, and if you need to leave, they are already packed up. Obviously if you have a lot of pets or several big crates this could be problematic. Ideally you have a basement for your storm shelter and they crates can stay there. If your pet appears to have a thunderstorm phobia, ask your vet what to do. I have several clients who deal with this in different ways. Here’s an article about it. Everyone has dozens of pictures of their pets on their phones, but you need to have some recent pictures printed out. This can help you identify a pet that may be lost during a storm. If there will be long periods without power in the aftermath of the storm, you may need to save your phone power. These pictures should be kept in a safe place with your other important papers. Hopefully you’ll never be in a situation when your house is damaged during a storm. Take the time now to get a plan ready for your family and your pets so you will be prepared if something does happen. It’s not a bad idea to do a drill either. In many places the National Weather Service do drills once a month, so that may be a good time for you to do a dress rehearsal for your plan. where dog trainer Justin Silver trains dogs and their owners. I haven’t watched the “Dog Whisperer” or anything Victoria Stillwell has done, so I can’t say if this is similar or not. I enjoyed “Dogs in the City.” I haven’t discussed any of the particulars with any of the trainers I know, but I liked his main premise: The dogs pick things up pretty quickly. It’s the people that take the time to train. I learned from the first 2 minutes of the training class I took with my lab that I needed the class as much or more than the dog did. Silver shows the pet owners how to manage their pets. 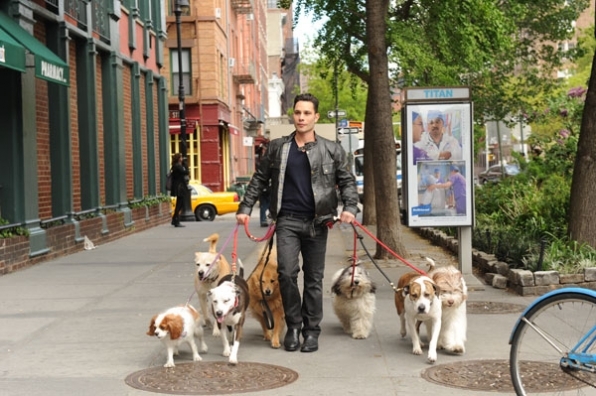 You will think you know people that are in the show by the way they act with their dogs. They are in denial as far as their aggression or other behaviors and he gets the owners to change their ways. There are a lot of neat shots of dogs taken around the city as well. I think most dog owners would enjoy this. Fetch! Pet Care of NW Atlanta provides dog walking and pet sitting services as well as providing cat care in Roswell, East Cobb, Marietta and Woodstock.